The Health and Safety Executive (HSE) Emergency First Aid at Work (EFAW) course is ideal for smaller workplaces that present few health and safety risks. It is a requirement of the Health and Safety at Work Act 1974, that employers should provide a safe environment for their employees. If your assessment of first aid highlights the need for HSE Emergency First Aid at Work (EFAW) first aiders, then this course, taught by clinical experts who make learning fun, is for you! For help in identifying the correct course please use the assessment pdf. We are of course happy to help should you need further assistance in considering what is high and low risk. The HSE Emergency First Aid At Work training is usually suited for first aiders in low/medium risk working environments. The EFAW training course is also suitable for individuals who want or require training for personal or professional development. 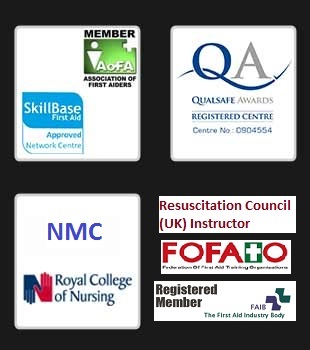 The HSE Emergency First Aid At Work training course is suitable for up to 12 people. Please contact us for larger group information. This is a full 1 day (6 contact hours) course. The price of our HSE Emergency First Aid at Work course run from your own venue for up to 12 people is from £420. On successful completion of the Emergency First Aid At Work training course, candidates will receive an HSE recognised, Emergency First Aid at Work – EFAW Certificate. This certificate is valid for 3 years although the HSE strongly recommend a yearly half day update.